It will be thirty years later this month since a bomb exploded on board Pan American Flight PA 103 (lead image, left), en route from London to New York. The false narrative of the British and US governments, contrived at the time to blame Libya and warrant the overthrow of Libyan leader Muammar Qaddafi, required falsification of evidence and the conviction in a rigged court proceeding of the wrong man. It has also required spying to disrupt the efforts of the families of those killed to uncover the truth. The extent of that operation was exposed last week in a partial release of British Government documents from the UK’s National Archives. Among the spy operations revealed were telephone taps, hacking into computers, and interference with emails. 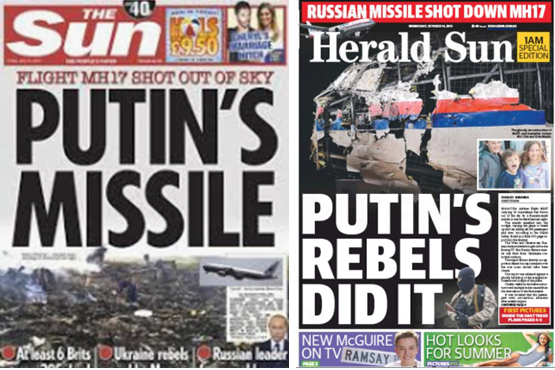 The archive disclosures also show that the same modus operandi has been under way since 2014 to fabricate blame for the destruction of Malaysia Airlines Flight MH17 (lead image, right) over Ukraine, and justify global sanctions against Russia, plus operations to overthrow President Vladimir Putin. But thirty years of state secrets to warrant state lying aren’t long enough to hold those responsible for the lies to account, or for the truth to prevail against them. PA 103 was destroyed over Lockerbie, Scotland, on December 21, 1988. It had taken off from London and was at cruising altitude one hour into its flight to New York, when a bomb in the cargo hold exploded. All 259 passengers on board were killed, together with 11 people on the ground. Murdoch newspaper covers: left, February 24, 2011; right, October 20, 2011. The 30-year rule for withholding state documents on the case is now expiring at the National Archives. A preliminary report by a Murdoch newspaper claimed last week to have “seen” the documents, but it is not publishing them directly or in full. The report of the files appears in the Scotland section of Friday’s Times newspaper. The same story also appears in the Scottish Sun. The report reveals that officials of then-Prime Minister Margaret Thatcher’s government agreed on special, secret measures “for careful watching” of the relatives of the dead passengers in their attempts to investigate the evidence of what had happened. The newspaper report does not identify by name the Foreign Office officials whose correspondence to the Scottish Lord Advocate (Scotland’s state prosecutor) and to Thatcher was seen. Nor are details of the surveillance and hacking operations revealed, nor the role which the mainstream media and their reporters played in the official deception. Source: The Times, November 30, 2018. 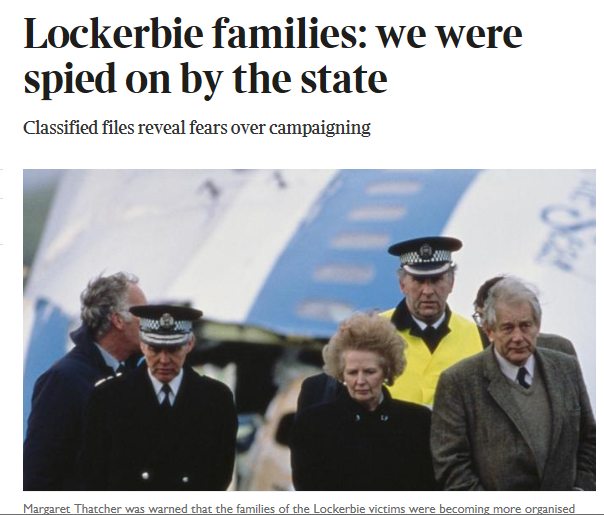 The newspaper report appears to confirm that most of the British government’s files on the Lockerbie case continue to be withheld; the most sensitive of them may have been destroyed to prevent public disclosure, victim representatives believe. The Murdoch media, which have led the public falsification, are unrepentant. In the case of MH17, the British courts have refused to open government files or allow lawyers for the next of kin to determine the cause of death for the ten British nationals killed on board the aircraft. The decision to suppress coroner’s court hearings in Britain was taken by the Home Secretary in July 2014, now Prime Minister Theresa May. For details of how this was done, read this. The Australian Government has gone further, suppressing the secret intelligence and legal memoranda exchanged between the Attorney-General and Prime Minister which conclude that the case for Russian culpability is unsustainable; for the details, read this. The same operations for planting fabricated evidence in the Murdoch press and other mainstream media, suppression of contrary evidence, and surveillance, computer hacking, and discrediting of alternative sources continue to be implemented by the Dutch and Australian secret services. One difference, though. The organizations of relatives of victims of the Lockerbie attack – mostly British and Americans – have proved to be better organized and more tenacious over the years, and far more hostile towards the state versions of what had happened. For a selection of the books making their case, click to open. The shooting-down of MH17 killed 298 passengers and crew. Not one family member has publicly challenged the Russian culpability story. Dutch sources say they believe that Dutch Foreign Ministry and secret services have combined to keep the families of the MH17 victims under constant surveillance. They have been encouraged to instruct lawyers promoting cases against Russian targets in local, European and US courts. They have been deterred from speaking to reporters known to be critical of the official version of what caused the destruction of the aircraft. Australian, and possibly US, secret service agents were visible during a coroner’s court hearing in Melbourne, Australia, in December 2015. That was the first of only two coroner’s court proceedings to have taken place worldwide; the other took place in Sydney in May 2016. The coroners were required by Australian law to investigate the deaths of the 28 Australian citizens or permanent residents on board MH17. For the manipulation of evidence during the Sydney court proceeding, click to read. 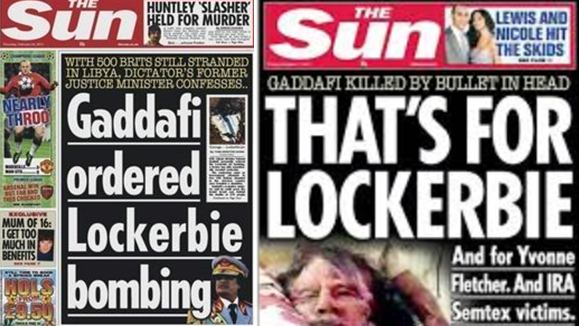 Murdoch newspaper covers: left, the London Sun, July 18, 2014; right, the Melbourne Herald Sun, October 14, 2015. In the Melbourne proceeding I was in court and watched as a group of government agents, men and women, worked to shield families of the victims from being approached and questioned by journalists. A row of reporters sat together at the rear of the courtroom; the families in the main rows of seats in the well of the court. I sat directly behind one of the families. As soon as I started asking questions of a family member, a woman in her mid-30s tried to stop me by claiming I was speaking too loudly; the coroner was not present and the proceeding was not under way at the time. The agent then whispered to other family members, and my conversation was stopped. That remark was never repeated.